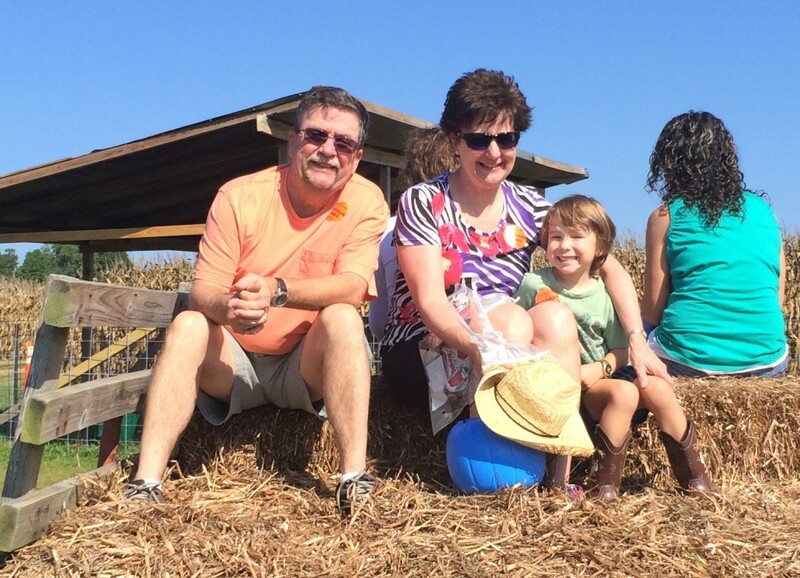 But anyway the actual apple picking part was fun! 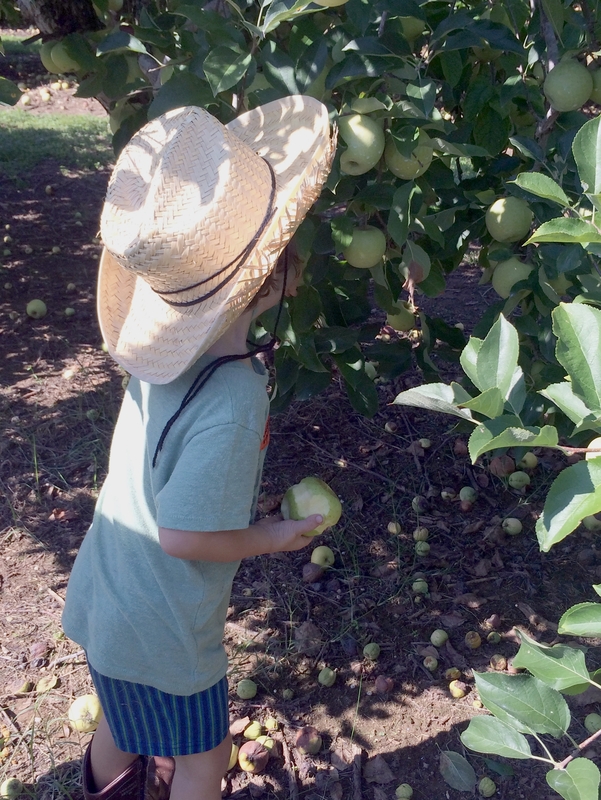 The trees were LOADED with fruit (mostly golden delicious), and the branches were plenty low enough for Big C to pick to his heart’s content. 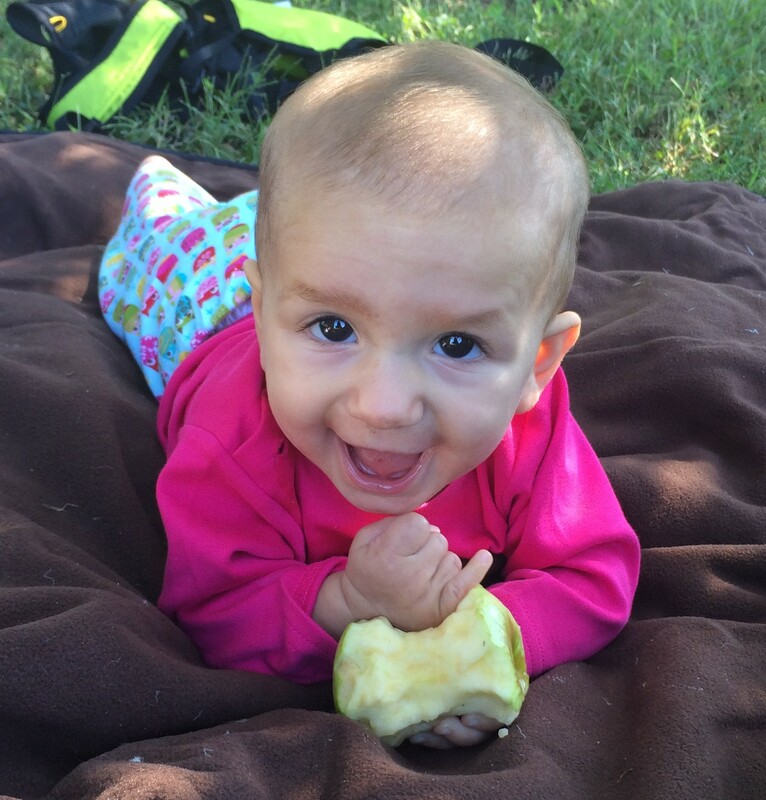 Between, me, Big C, and the grandparents, we picked over 50 apples, then all sat down for a nice picnic lunch before heading home. Day 1: Apple Butter -This was my personal favorite, mostly because of how yummy it was despite being ridiculously easy to make! We used this super-yummy spread almost any way imaginable (bread, fruit, crackers, etc), but my favorite way to eat it was with a spoon right out of the container! 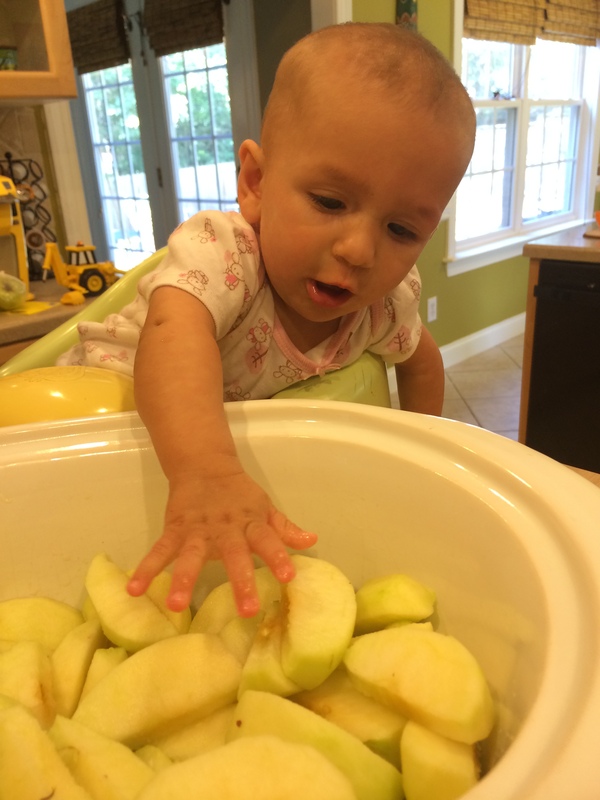 Day 2: Apple Pear Sauce – With a baby in the house, this was a must! Day 4: Apple Cinnamon Roll-ups – Or, as our family called them, “apples in a blanket.” Lots of yum crammed into a two-bite package! Day 6: Apple Volcanoes – Baked whole apples stuffed with all sorts of yummy goodness…butter and sugar and walnuts, oh my! All topped with a dollop of ice cream that “erupted” down the sides. Day 7: Dried Apple Chips – These were WAY cheaper than the store-bought variety, and even yummier. Perfect snack for on the trail! 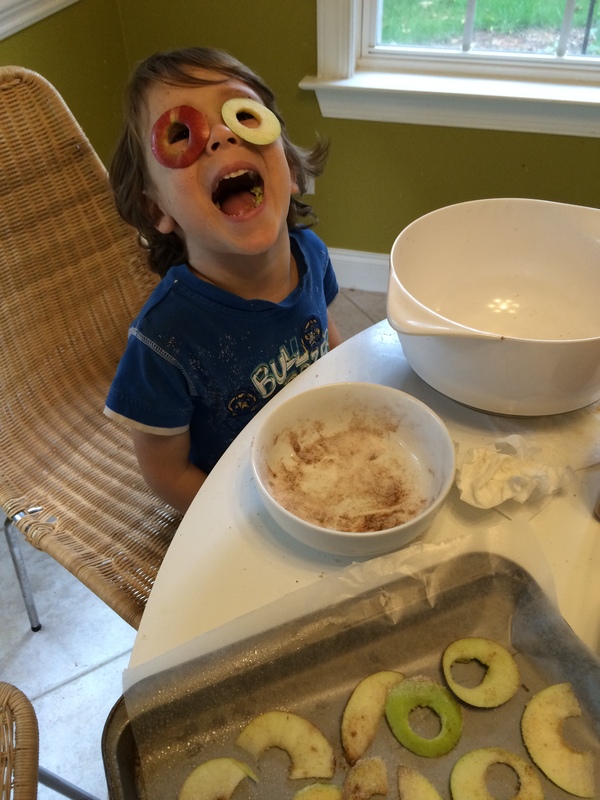 We also experimented with some creative ways to eat our apples raw, our favorite being the “apple sandwich.” Cored and sliced horizontally, an apple makes perfect “ends” to your sandwich, and the filling options are endless – nut butters, fruit preserves, cream cheese, nuts, raisins, even shredded coconut. For me the coolest part about our apple-themed kitchen adventures is that just days before, our apples were hanging on a tree. I love the fact that we were able to gather them ourselves and then turn them into so many delicious things, many of which we were able to share with family and friends! Hopefully it will be a good “where food comes from” lesson for Big C.
For the recipes we used, as well as even more ideas we haven’t gotten to yet, check out . If you are hungry inspired by all this talk about apples, you can find all the recipes we used (as well as ones we haven’t gotten to yet!) on ourFall Recipes board on Pinterest. 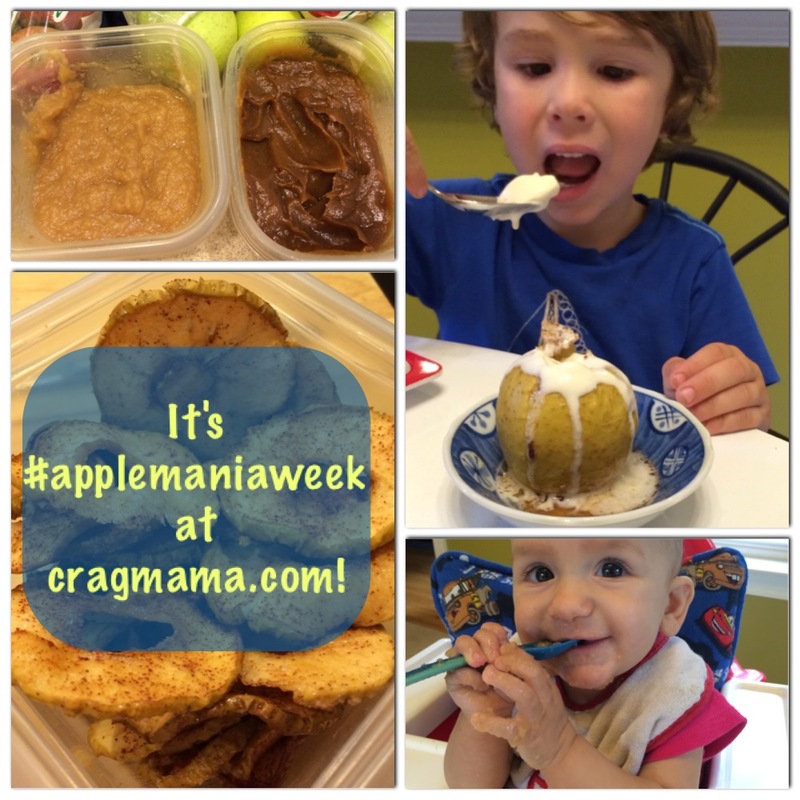 Also find us on Instagram at @cragmama1, and check out the hashtag #applemaniaweek, where I’ve been posting pictures of all of the apple-y goodness that has come out of our kitchen every day. Most importantly, feel free to use that hashtag and post your own apple pictures, so that we can glean some more ideas for apple fun!